This sermon continues our sermon series Adventuring through Acts, in which we examine some of the greatest hits found in the Acts of the Apostles. Last week Gail preached about the early church, how the community had come together. They now shared all they had freely, making sure that those in need were provided for. Through their ministry and attention to God the community grew. This week we will learn that, as in many communities experiencing change and growth, a tension arose… but existing leadership responded well by empowering new leaders to step up and tend to God’s kingdom. This scripture lesson provides us with a model to use and benefit from, when we as a church experience conflict. What they said pleased the whole community, and they chose Stephen, a man full of faith and the Holy Spirit, together with Philip, Prochorus, Nicanor, Timon, Parmenas, and Nicolaus, a proselyte of Antioch. They had these men stand before the apostles, who prayed and laid their hands on them. In this scripture reading we hear a story that was old by the time Luke started working on Acts. If you think about it, this is a rather embarrassing story of the early church. This is dirty laundry. If you consider what Luke was trying to do when he wrote, compiled, edited and completed the Acts of the Apostles, that is to write an orderly account of the story of the church, this had to be a difficult event to write about. Luke was assembling this work a few decades after the events reported in today’s scripture. This story would have been remembered by the church the same way events of a couple decades ago are recalled here in this church. There was an institutional memory of this event, and Luke, rather than ignore or dismiss a problem in the church, uses the story, as we can use it, to examine a way in which to handle conflict within the church. In reading this scripture, we have to recognize that there were factions very early on in our early Jerusalem church. There are sub-identities within the church. There are two listed in this report. Scholars debate exactly what is meant by Hellenists and Hebrews. And, truth be told, we are not going to spend time exploring it. It does not matter, we just need to know that there are groups and they each have an identity. Identities within a church are not always problematic. Indeed, it is my hope for everyone that, for periods of time, one’s role or roles become a part of their identity. That is why the various committees and officers in a church have titles like Deacon, Teacher, Collector. For years it provided much joy for me to be able to say, “I am a Sunday School teacher.” It was part of my identity. Further, when one asks someone about their place in the church, they will often state things like when they joined, how they serve, and what ministries they were part of that they found most fulfilling. Our role and experience in church is part of our personal identity. But when the labels or identities are used to create splits, become cliques, or to be dismissive of another’s perspective, it becomes a problem. These sorts of identities can exacerbate tension. 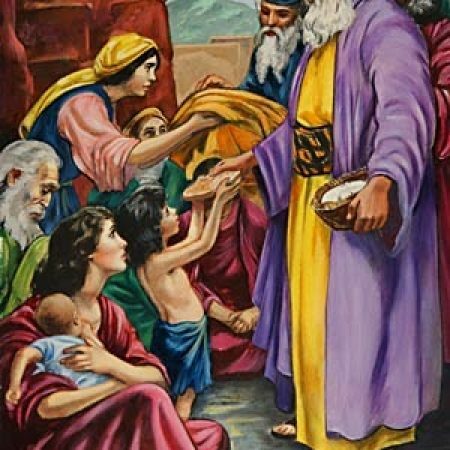 The Hellenists complained against the Hebrews because their widows were being neglected in the daily distribution of food. There is some squabblin’ going on. A squabble is conflict. It is generally not a huge deal; usually a low level of concern. The charge of the complaint was not being leveled against the church in its entirety. Rather, it is being directed by one subgroup at another subgroup within the community. The “Hellenists” a group with one identity have a problem with the “Hebrews” a group with another identity. Squabblin’ is always going on in churches. A pastor I know says there should always be a little conflict in a church. Managed well, it means that there is life and growth and change in the congregation. If there is no conflict, no disagreements, a church is in real risk of dying. Sometimes squabblin’ is just squabblin’. But squabblin’ can be indicative of bigger problems. How many times have we witnessed, or even participated in, a petty conflict (at home, at work, at school, at a meeting, even at church), because it was easier, safer, and, in some cases, stress-relieving to have a minor fight, and thus avoid the bigger problem. The bigger problem in the ancient church is that, while the community has indeed grown in size, it has not necessarily grown together. A key division of identity (Hellenist versus Hebrew) had materialized within the group. In Christian unity there should be no Hellenists versus Hebrews; Trustees versus Deacons; East versus West. There should just be Christian. THE TWELVE HEAR THE NEED and they understand the presenting issue, the subject of the squabble, food distribution to widows. They also recognize there is a bigger problem of unity. It is important to note that the twelve really do hear the need and understand the problem. But what they don’t do is convene hearings. They don’t commence a fact-finding inquiry to get to the bottom of the source of the issue, or to lay blame with a particular individual committee or group. Rather, like good leaders, they set about rectifying both the presenting problem and the underlying problem. But they, like many leaders here at Union Congregational Church, don’t have the capacity to do more. The twelve are already responsible for Preaching and Praying and other administrative tasks. It is a good thing the Holy Spirit is leading the twelve, otherwise I might imagine these former fishermen and tax collectors might be a little out of their depth. THE TWELVE PUSH BACK ON THE CONGREGATION, they are not going to own this problem. Leadership responds with a call for new leaders from the congregation. Note these will not be leaders appointed by other leaders, but leaders selected from within the congregation, by the congregation, the entire congregation. The congregation responds positively. The congregation nominates seven men who meet the requirements. Seven individuals of Good Standing. Seven individuals Full of the Spirit and Wisdom. The word of God continued to spread. The disruption is over and the Kingdom, now strengthened, grows. Jewish Priests were becoming attracted to, and converting to this new WAY, this new understanding. Stephen preaches, teaches, and performs miracles. Phillip becomes an amazing evangelist, spreading the church beyond Jerusalem, beyond Palestine, and is considered the founder of the Ethiopian Church – a denomination 50 million strong today. A squabble over food distribution led the early church to the next steps in growing. Leadership expanded. The Kingdom was furthered. The Body of Christ strengthened. There are some implications in this story for us to consider today. The first is that conflict, while often uncomfortable, if managed properly can be an opportunity. The second is that the symptom being brought to attention may by symbolic of a larger problem. The third being every squabble is an opportunity to empower new leaders to grow the Kingdom of God, either by expanding existing ministries, or creating new ones. Squabblin’ is going to happen. That’s a fact. If it was a rarity, there would not be over 2,000 results when one searches for books regarding church conflict on Amazon. I wish I were kidding – 2,000. Conflict does not have to affect the entire church. For as William Willimon, a scholar and Bishop in the United Methodist Church once wrote, If the members of a church school class have a life or death battle over the color of the carpet in their new room, the pastor, while chagrined at their choice of argument, at least can be pleased that they have understood that their involvement in the church is a matter of life and death. In other words, If we didn’t really care about one another and the faith, there would be no conflict. We are willing to argue and take risks when the stakes truly matter. For the conflict averse, as many of us are, take comfort that out of a well-managed conflict, great things can happen. Fans of jazz music have known this since the beginning of jazz. There are often times when jazz musicians will improvisationally contest for the direction of where the music is going. When well managed with proficiency, thoughtfulness and respect, out of this conflict arises the beauty and promise of great jazz. It is that thoughtfulness and respect in managing squabblin’ that makes all the difference. We should keep thoughtfulness and respect in mind when conflicts arise. Through listening and hearing called for in the Covenant, we speak to the second point of the lesson. Diagnosing the surface problem is important, but addressing underlying concerns makes all the difference. You can cover a wound with a bandage, and it might even heal over, but, if the injury is deep, the body is still wounded and still suffers. When a problem appears, we should listen, like the twelve did, to determine if there is a larger underlying problem. Listening, hearing, understanding can reveal the depth of issues. A church not far from here once considered selling their meeting house and building a new one on a new property. Land was purchased, but, like many a church building project, the scope was beyond their hopes. It was decided that any selling and building would be delayed. And, rather than a symbol of hope, the land became a source of contentiousness. There was squabblin’ about the land and it had many colors and shades. Yes, there were camps and identities. People in the congregation were thought of as being pro-land and anti-land. Some relative newcomers to the church mentioned that they loved to garden, but as apartment dwellers, they no longer had a place to garden. “Wouldn’t it be nice if we could plant some vegetables on the land. We could even give them to a food pantry.” As is typical in church, a committee was formed, the newcomers were on it, one co-chaired. The church council blessed the committee, and got out of the way. And that committee created a plan, and followed the plan. They organized planting, weeding, harvesting, and delivery to the food pantry. A few folks not interested in the church, but interested in gardening and feeding the hungry, heard what was going on. They helped out. And once in a while, they would attend church. And then some of them got more interested in church. And a few of them actually joined the church, and they began to serve God in ways unrelated to that garden. And God’s kingdom grew stronger. And complaints about the land dissipated. Our scripture lesson today informs us that out of squabblin’ can come wonderful works. Squabblin’ can sometimes indicate a deeper problem. In addressing the deeper problem, if those empowered are not the “usual crowd” but include faith-filled people new to leadership, leadership in the church grows, the church is stronger and peace and harmony are reestablished, at least until the next squabble. And with God’s grace, and Love as demonstrated by Jesus, the church will grow and continue to grow. © 2019 Union Congregational Church.